Can I use my Hamilton CapTel account on my Android Smartphone and Tablet? I have a Hamilton CapTel Call Me #, can I use it on my Android? I have a Hamilton CapTel Call Me # on my Android. Why aren”t my calls coming through? I have a Hamilton CapTel Call Me # on my Android, if I use Hamilton CapTel on a PC/Mac, where will my calls be directed? I have a Hamilton CapTel Call Me #, but I’m not logged in on my Android Smartphone. What happens when someone tries to call my Call Me #? Yes. Once you download the Hamilton CapTel App, simply enter your Hamilton CapTel username and password and log in. Place and receive calls with the app and start receiving captions immediately. Yes, you can use your Hamilton CapTel account on your Android Smartphone and Tablet. However, if you have a Hamilton CapTel Call Me #. you will only be able to receive calls on one device, not both. Your calls will be routed to your last device used with Hamilton CapTel. From the Hamilton CapTel App call screen, enter the number of the person you wish to call in the “Number to Dial” box. To select a number directly from your Android’s contact list, simply click on “Contacts” at the top of the screen. Be sure that your headset is properly connected and ready to use. After placing the call, you will automatically be taken to the Captions screen where you will connect with the captioning service. Your Android will ring, notifying you that you have received a call from the Hamilton CapTel Call Center. Once you answer, the phone number of the person you wish to call will automatically dial. 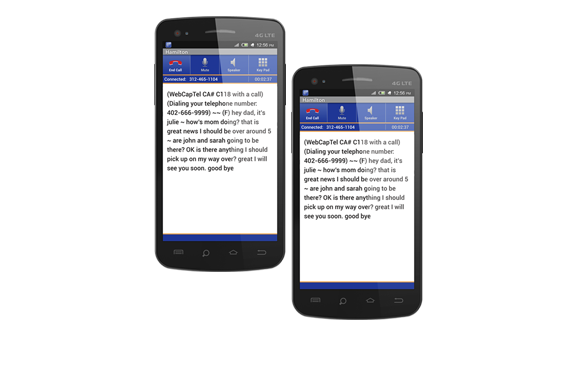 The Hamilton CapTel App for the Android will automatically appear on your screen so that you are ready to view the captions of your call. You can enter the 10-digit number you would like to dial in the “Number to dial” field. When connected, you’ll be able to listen while reading captions of the instructions and use your phone to enter numbers when prompted. To access your phone’s keypad, you will need to swipe the top task bar and select the phone application. To return to the captions, use the back button on your device. Yes, you can select numbers to dial from your Android Contacts through the Hamilton CapTel App. Simply touch the “Contacts” tab within the app and you’ll see all of your contacts there. Select the name/number of the person you would like to call and your call will be placed! Yes. Receiving calls on the Hamilton CapTel App for Android with your Hamilton CapTel Call Me # is easy. The Hamilton CapTel Call Me # is a ten-digit phone number that anyone can use to call you directly. Upon answering, captions of what’s being said will be displayed on the screen of your phone. First, visit the “Options” tab in the Hamilton CapTel App. In the “My Phone Number” field, be sure to enter the phone number associated with the Android you are using, which can be updated at any time in between calls. Not sure you have a Call Me #? Simply go to the Hamilton CapTel App and open the Options Tab. If the Hamilton Call Me # field has a ten-digit number, this is the number you can share with family, friends and businesses! If you do not see a number, you can log into your account on a PC/Mac and visit the “Receive Calls” section. After you’ve received your Hamilton CapTel Call Me #, all you have to do is open the app on your Android and make sure that Receive Calls is set to ON. Yes, you can! To find out if you already have a Call Me # associated with your Android, visit the “Options” tab. If you see a ten-digit number in the “Hamilton CapTel Call Me #” field, you’ve already registered for a number. If you don’t see a ten-digit number here, simply log into your account and visit the “Receive Calls” page. If you log into Hamilton CapTel on a PC/Mac, your captioned calls will be directed to your PC/Mac and to the number that is entered in the “I’m at this number” field. Once you log out of your PC/Mac, your Android will start receiving captioned calls again. With your Hamilton CapTel Call Me #, the person you are calling will be able to view your Call Me # via Caller ID. Yes, you can view captions of a conversation immediately after the call is disconnected. If “Save Calls” under “Options” is checked in green, your calls will automatically be saved and you will have the ability to view them at any time. If this feature is not set, you will receive a prompt after each call asking whether or not you would like to save your captions. Disclaimer: Generally, Hamilton® CapTel® will work on Android™ smartphones running operating systems 2.2–7.1. Please contact Hamilton CapTel Customer Care if you have any questions about the compatibility of your current version with Hamilton CapTel.